Physiologic jaundice is a fairly normal newborn occurrence. You will usually see this between days two and five of your new baby's life. Typically it presents as a yellowish tinge to your baby's skin and eyes. Some babies may also be very sleepy and/or have feeding difficulties. Jaundice is caused by the inability of the baby's immature liver to break down red blood cells, leading to an increase in the levels of bilirubin in the baby's blood. This is a fairly normal occurrence. To help speed up the process, you should be sure that your baby is taking in plenty of fluids, preferably breast milk. Breast milk is a laxative, helping to move the meconium from your baby's bowels. This can help lessen the incidence of jaundice or decrease the amount of time that you deal with jaundice. Your baby may have blood draws taken to measure a substance called bilirubin. The build up of bilirubin is what causes the yellowish tinge to your baby's skin. 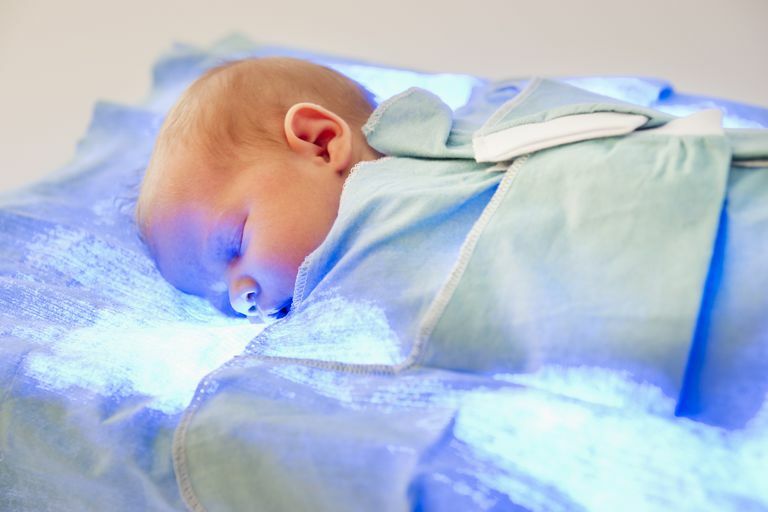 If the bilirubin levels, often called bili, go above a certain level your pediatrician may ask that you use a type of phototherapy called bili lights. Bili lights can come in a blanket form. This is used to wrap your baby up in the bili light blanket to expose their skin to light which helps break down the bilirubin. They also have older models that are more like lighted suitcases. You may also expose your baby to indirect sunlight to help speed up the process of the breakdown of bilirubin. Breast milk jaundice is caused by a non-harmful substance in the breast milk of some women. While the jaundice caused by this form of jaundice can last longer, it does not tend to have high fluctuations in the levels of bilirubin found in your baby. Dr. Jack Newman, pediatrician and breastfeeding specialist, recommends that breastfeeding not stop in order to diagnose this form of jaundice. He stresses that breast milk is not harmful to these babies and in fact, is still the best bet for the baby nutrition wise. Physiologic jaundice may not show up until your baby is up to five days old. This means that you are probably not still at the hospital or birth center. If you see a yellowish tinge to your baby's skin, your baby seems lethargic or very sleepy or refuses to eat, call your pediatrician immediately. A quick blood test can usually confirm that your baby has jaundice and treatment can begin. If your baby has low levels of bilirubin treatment is usually just expectant management, or watching your baby. Ensure that your baby is nursing well and consider exposure to indirect sunlight. This can usually be placing baby in a diaper near a window for brief periods of time. You may also be asked to have the blood work repeated to check that the bilirubin levels are going down. Problems associated with high bilirubin are very rare. However, they are potentially very serious. Be sure to report any jaundice to your pediatrician for care.